Richard Flory is senior director of research and evaluation at the USC Center for Religion and Civic Culture. This is true even in an otherwise conventional field as religion, with perhaps the most illustrative example being that of the state’s megachurches. Indeed, California has more megachurches than any other state. There are over 200 Protestant, theologically conservative churches with at least 2,000 weekly attenders. And while most are in major metropolitan areas, megachurches can be seen in the Inland Empire and the Central Valley, on up through Sacramento and as far north as Redding. In my multiple research projects conducted over the last 25 years, I have seen that California megachurches have played a significant role in how millions of people – Christian or not – understand Christianity. Large churches have been around since the industrialization and urbanization of the U.S. in the 19th century. But it was only in the the mid-20th century that megachurches became a phenomenon. Beyond their large size - which can range from the threshold 2,000 regular weekly attenders up to 25,000 to 50,000 attenders at U.S. megachurches - it is the number of different activities, outreach programs and suburban locations that characterize these churches. In my view, the most important characteristic of megachurches is their ability to “appropriate” elements from the larger culture, be it popular music, performances or even dress styles. 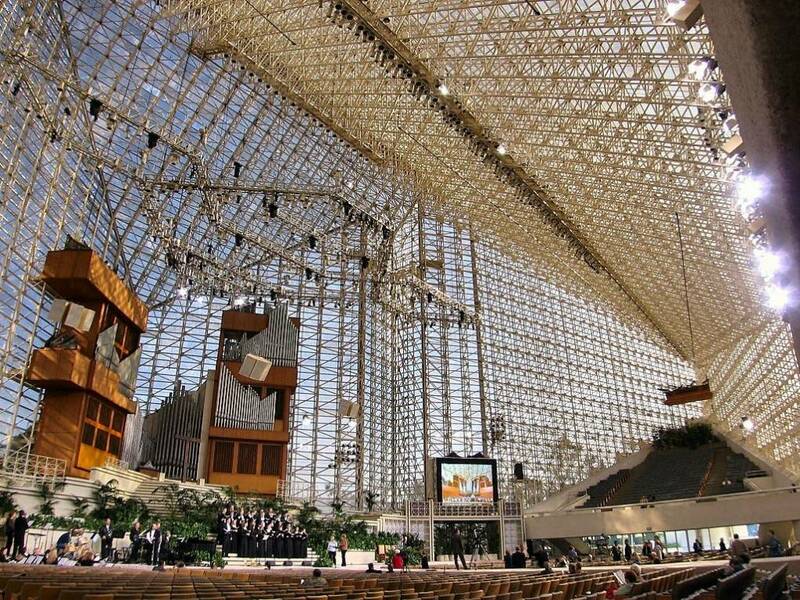 While they are found in major cities across the U.S. and globally, it is in California that megachurches led the way in merging larger cultural trends into people’s religious lives. Two important examples illustrate their impact. The first is the Crystal Cathedral. Founded in 1955, this church became famous for its weekly television show, “The Hour of Power” and glitzy holiday productions at Christmas and Easter. Televising the morning service from the Crystal Cathedral both extended the reach of the church and allowed people to enjoy Sunday worship service from the comfort of their living rooms. The holiday productions, complete with performances from live animals and actors, were aimed at bringing people into the church to see, hear and experience biblical stories. For example, the Christmas story from the New Testament Gospels was reenacted in the main sanctuary of the church with Jesus, Mary and Joseph in the stable, along with the wise men, angels, and even camels and donkeys. The Easter story was similarly reenacted with a depiction of the crucifixion of Jesus, Roman soldiers, weeping followers and an empty tomb. However, perhaps more important than those costume dramas, was founding pastor Robert Schuller’s idea to use a local drive-in movie theater for Sunday services. Motivated at least in part by the lack of availability of other venues, Schuller turned the necessity of meeting in a drive-in theater into a cultural adaptation. In the post-World War II jobs and housing boom, Schuller capitalized on a Southern Californian’s dependence on and familiarity with the automobile. People could come to church and never have to leave their car. Thus, partly out of necessity, partly out of vision, Schuller combined the car culture of Southern California and the more casual vibe of the region, by linking church with what people did in their everyday lives. The second example is Calvary Chapel, best known in evangelical Christian circles as the epicenter of the emerging Christian youth culture in the late 1960s and early 1970s. 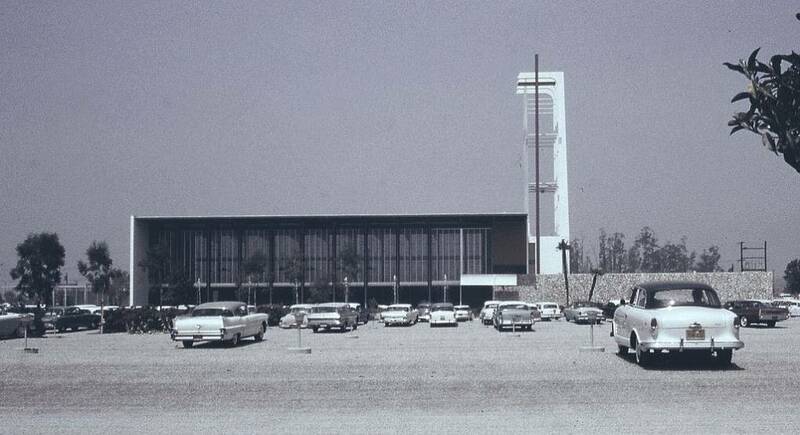 Calvary Chapel was founded by pastor Chuck Smith in 1965 with 25 members in the Orange County city of Costa Mesa. Exhibiting a similar vision as Schuller, Smith created a church that embraced the surrounding culture by accepting young hippies and surfers into its fold. People came to church wearing jeans, shorts, T-shirts, beach slippers and even barefoot. There was no need to “dress up.” Once there, they heard a traditional, “Bible-based” sermon from Chuck Smith. But what really differentiated Calvary Chapel was its inclusion of music that sounded just like the popular rock and folk music of the day. Calvary Chapel became a hub of activity for young people in the “Jesus Movement,” that combined a conservative evangelical Christianity with the look of the countercultural hippie style. Calvary Chapel sponsored concerts of “Jesus music” which was essentially folk and rock music with Christian lyrics. These concerts attracted scores of young people. Rather than Sunday services being characterized by organ and choir music, guitars and folksy music with Christian lyrics became the norm. Calvary Chapel institutionalized and popularized the music through the creation of the Maranatha Music, a record label that soon gained immense popularity. Along with other Christian music labels that followed, this music reached a much larger population of evangelical Christians than any concert or church worship service could. Indeed the music proved to be so popular, that it quickly moved beyond the Calvary Chapel and the Jesus People, replacing more traditional “organ and choir” music in most evangelical and charismatic churches. Ultimately, this music found its way into the Protestant mainline and Catholic worship services, transforming the way that Christians in these other traditions experienced Sunday worship services. Today there is a worldwide association of over 1,700 Calvary Chapel congregations, all traceable to its Orange County origins. Current iterations of California megachurches, such as Mosaic and Oasis in Los Angeles, C3 (now VIVE Church) in the Bay Area, among others, follow a similar script and arguably build on elements of California culture: the promise of a comfortable experience in church, the opportunity to feel good about oneself, and participation in a community of like-minded people that doesn’t require any deeper commitments unless one so desires. Across the country, the broader impact of the California churches can be seen in the different ways that megachurches, such as City Church in Seattle, which caters to young Christian hipsters, or the more family-oriented programming at Willow Creek in Chicago, have adapted their purpose and programming to specific cultural currents in order to create their own unique identity – an approach pioneered in California. This article originally appeared in The Conversation, an online publication that features academics writing about their research and ideas for the public. KQED and The Conversation are partners in the California Dream project, a collaboration looking at the Golden State's promise, whether we are achieving it, and the future of California.